Situated on Marmari beach, the most beautiful coastal stretch on the Aegean island of Kos, the fine A Class Caravia Beach is surrounded by magnificent gardens, blending harmoniously into the local landscape. 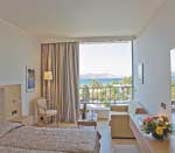 It is located 15 minutes from the airport and just a shot bus ride away from the bustling city center of Kos town. The hotel is dedicated in serving the international business and leisure travelling community. The main building and bungalows provide 300 spacious and comfortable rooms, all of them carefully designed for comfort and convenience. Each room is appointed with private bath, hairdryer, fridge, telephone, air conditioning, TV-Satellite. For culinary pleasures, Caravia Beach features a cocktail lounge, snack bar and a full service restaurant with Greek and international menus offering a dining experience whether a Mediterranean specialty or a light delicacy. Try the traditional Greek coffee, enjoy a refreshing juice or have fun with colorful cocktails. Let your mood guide you to one of the hotel's restaurants and bars. The Mini market near the Salon de Coiffure, sells small gifts and souvenirs. There is a large range of recreational facilities available for all ages and tastes. On the four-kilometer golden sandy beach guests can bask in the sun, enjoy the alluring blue sea or choose from a wide range of sea sports. Do not hesitate to participate in an "island safari" by jeep; you can also rent a bicycle, a motor bike or a car for an excursion to discover the beauty and scenic wonders of Kos. The hotel has two swimming pools, tennis courts, mini golf with flood lights, volley ball and football pitches, boccia, children's playground, table tennis, billiards and a TV-video room.